DISCOVERY Choose a Guided Walking Tour of Cologne’s important Jewish heritage sites. Don’t miss the chance to enjoy free time over a glass of Kölsch pale lager—locally brewed for over 100 years! 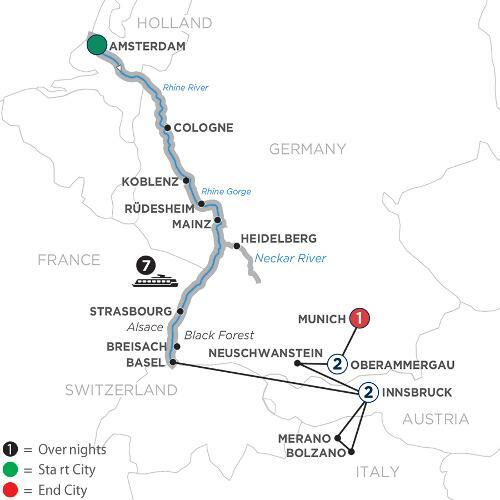 One of Europe’s most legendary rivers awaits you on this exciting Rhine River cruise, which takes you across Germany and touches in Holland, France, and Switzerland! You’ll also be our guest in the Bavarian village of Oberammergau for the once-a-decade performance season of the world renowned Passion Play. This magnificent European river cruise begins in the ever popular, modern city of Amsterdam, Holland, where you’ll enjoy a guided cruise along its legendary canals. Visit Cologne, Germany a 2,000 year-old city known for its gothic architecture, famous twin spired cathedral, and Old Town with many shops, cafés, and taverns. Pass through the dramatic Rhine Gorge where ancient castles stand on cliffs 400 feet above the water. Visit the unique Siegfried’s Mechanical Musical Instrument Museum in the charming wine town of Rüdesheim, then continue your cruise to Mainz to visit to the captivating Gutenberg Museum or Heidelberg Castle. In Strasbourg, France, you’ll be amazed by the red sandstone gothic cathedral with ancient murals and the fascinating astronomical clock. Stop in Breisach, Germany, the gateway to Germany’s Black Forest an area of unrivaled natural beauty best known for Black Forest ham, cherry cake, and the cuckoo clock. Continue your European vacation on shore for a guided tour of Austria and Germany and Italy, starting with sight-seeing in Innsbruck. Continue with a visit to Merano, Bolzano, and Neuschwanstein Castle. The highlight of your trip is a visit to the idyllic Bavarian village of Oberammergau, Germany, to attend the Passion Play. Performed once every ten years by the residents of Oberammergau, the Passion Play is a stunning theatrical event dating back to 1634. Enjoy VIP seating and accommodations in the heart of Oberammergau. Next, enjoy guided sightseeing in Munich, including Nymphenburg Palace, the Marienplatz, and gothic Frauenkirche. Sample Munich’s Biergärtens and cafés, and see the famous Glockenspiel. The perfect blend of adventure, relaxation, and inspiration your Avalon Rhine River cruise with the once-a-decade performance of Oberammergau’s Passion Play is truly a once-in-a-lifetime experience. Prices do not include port charges of $182 per person.